Back in 1988, when I was only 20 years young, my musical taste was this: Def Leppard, Europe, Bon Jovi, Treat… Melodic rock where keyboards were as important as guitars, where big choruses and catchy, radio friendly melodies were a must. Sure, I dug Iron Maiden and Judas Priest still, but I thought it was a brilliant idea when they started to use keyboards in their music. I thought that Crazy Nights was one of Kiss’ finest moments and that the fact that the keyboards were as high in the mix as the guitars was exactly how things should be. Oh Lord! Well, that year was the first time I was acquainted with Helloween for real for the first time. Sure, I knew about the band and had heard a song or two from their debut LP Walls Of Jericho (1985), but I didn’t like what I heard and dismissed them as just another useless speed metal band. See, I hated speed, thrash and black metal back then. I didn’t even like Metallica – thought they were crap. So when Helloween added lead singer Michael Kiske to take over vocals from the underwhelming Kai Hansen (Hansen’s vocals on Jericho is plain horrible) and released Keeper Of The Seven Keys in 1987, I couldn’t care less. To me, they were still a speed metal band and speed metal was crap. Period! But one day my little brother told me that I just HAD TO listen to this track called “Dr Stein” by this band Helloween. Yuck! Well, I listened and dammit, wasn’t this song really good? Yes it was. So I borrowed the Keeper record from a friend and wondered where the hell that “Dr Stein” track had gone. Well, I got hold of the first Keeper record and it blew me away. Needless to say, buying Keeper Part 2 was a no-brainer and after that, I had become a Helloween fan. Record company trouble emerged when the band broke big with the Keeper albums which made their follow-up, Pink Bubbles Go Ape (1991), come out way too late – three years was a very long time back then – and when it finally saw the light of day, the big buzz had disappeared and Helloween weren’t the new hot dudes anymore. Also, original guitarist and main song writer Kai Hansen had left the band and with him he brought some fine song writing. This made Pink Bubbles a mediocre album, great songs mixed with the lowest of the low and the new guitarist Roland Grapow sure was no Kai Hansen, especially when it came to song writing. Some people had predicted Helloween as the new Iron Maiden and that they would be the new metal kings after them, but that sure as hell never happened – not even close. Chameleon from 1993 became Helloween’s last album with Kiske at the mike. Chameleon was a damn fine record, but musically it didn’t have anything to do with Helloween. It was a pop record full of soft melodies, acoustic guitars and even horns. There was no metal at all to be found on that album and it really should have been released under another name. That’s also when I lost interest in the band. When I heard that Andi Deris from Pink Cream ’69 had become their new singer, I just didn’t wanna know. To me, Kiske was Helloween. I did listen to their come back album Master Of The Rings (1994) and style wise, they were back for sure, but I found that record mediocre and dull and that’s my opinion on more or less every Helloween album since then. The attempt to wake the interest by doing a Keeper Of The Seven Keys Part 3 in 2005 was so obvious and overblown that it became ridiculous even though it was a good record. If we include the new record, Helloween has released 10 albums with Deris as a singer and even though none of them has been crap, I haven’t found any album good enough to buy, no album that you could play next to the classics. But with their last album, Straight Out Of Hell (2013), something happened. The sound on the album was heavy, but still glossy enough and the catchy melodies and riffs that I have been missing were suddenly back again. For the first time since 1993, there was a Helloween album that made me feel hope, an album that I actually really liked. I don’t know if I can say that I had high expectations for this album because of that, probably not, but I sure was curious to see if the band would follow in the footsteps of its predecessor. The album opens with “Heroes”, a plain, straight forward hard rocker with an instant melody – very good. “Battle’s Won” follows and it is a fantastic song, a classic Helloween:er with an “Eagle Fly Free” (Keeper II) – vibe, catchy as can be. The title track is a real killer as well, heavy and melodic and it has a sound that makes me think of the second Keeper album. “Stay Crazy” is a catchy metal tune, but the verse is more memorable than the chorus, so I guess it’s not a total winner all the way. I hear a single in “Lost In America” and this must be the closest thing to “I Want Out” that they have ever written and in my book, this is the kind of song Helloween needs. “Russian Roulé” sports some cool russian influenced melodies, all of them very catchy and memorable – great song. The band take a darker turn with “The Swing Of A Fallen World”. It’s not in the vein of The Dark Ride (2000), but it’s not as happy sounding as the rest – a good song, no matter what. I haven’t heard a really good ballad from Helloween since “A Tale That Wasn’t Right” and “We Got The Right”, but with “Like Everybody Else”, it’s time. A great ballad is what every Helloween album needs, if you ask me. I love it when they slow things down for a bit of a breather. Yeah, almost forgot, this has big single potential as well. “Creatures In Heaven” is ok, but this song is too much standard power metal over it for my taste. It’s ok, but not my case of beer. “If God loves Rock ‘n’ Roll” is a commercial hard rock song with a big hit hook and sounds just the way Helloween has sounded since Andi Deris joined them – only better. Yes, I really like this one. I don’t know if it’s intentional – it’s probably not – but I hear influences from My Chemical Romance in the melodies of “Living On The Edge”. I really hope it is intentional because with that mixed with the Keeper style, we get a different kind of Helloween – and that is a good thing. “Claws” on the other hand sound unstructured, just fast and noisy and doesn’t really go anywhere. They end the album on a good note with “You, Still Of War”. The tune goes into progressive territory and has a darker kind of heaviness, yet still very melodic and almost catchy. I also love the keyboard arrangement. Well done! You will get three more unreleased songs if you get the deluxe edition, but in this case, I’m not sure it’s worth the extra dough. “I Wish I Were There” (I were…???) isn’t bad, but it’s really not that great either and I just can’t get a grip on it. This has “bonus track alert” written all over it. “Wicked Game” is not a cover on the Chris Isaak song, thank God. But it is a bit forgettable even though the keyboard work is really good. “Free World” is ok, fast and heavy with some good melodies and the solo break smells like Keeper, but otherwise the song lies on the mediocre side. I’m sure this will go under debate among Helloween fans, but I find this album really awesome. It feels like the last album was a bit of a warm up for what’s to come and this album is the answer to that, like they finished here what they started with that one. I believe this is their best record since Chameleon and easily the best they have made with Andi Deris in the band. The catchy melodies are back, they way that they sounded back when and that happy-go-lucky – in a good way – choruses that had you humming them for days after only one listen. The production is faultless as well, pretty hard but still very accessible. The thing is, this album is better without the deluxe edition songs because those song aren’t as strong as the ones that ended up on the actual album – this time these songs deserves to be bonus tracks. To mention all the million members that has walked in and out of Helloween takes too much space but other than Deris, original members, guitarist Michael Weikath and bass player Markus Grosskopf (which actually means big head in English), Helloween also consists of Sascha Gerstner on lead guitar and drummer Daniel Löble. 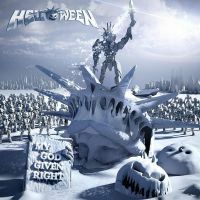 Why Helloween has found a new spark with this record, I have no idea, but I’m glad that they have. Back in 1988 I was hoping – and thought – that Helloween would be the next big thing, in 2015 I think that they just might be ready to rise a notch on the popularity scale. Because hopefully this is just one great album of many to come.